(Nanowerk News) Floating gate Flash memory has been scaling at a tremendous pace in recent years to arrive at a startling density of 32 gigabit (4 gigabyte) on a single die today, using 30nm technology and below. Drastic device concept changes are however required for future generations to cope with the scaling limits of today's floating gate technology. For example the electrostatic cell-to-cell interference and the low storage electron count are becoming major obstacles for further downscaling in the 20 and 10nm range. Figure: Vertical Flash transistor. 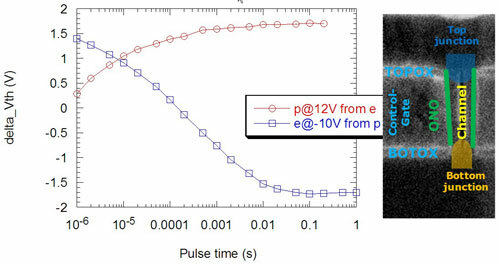 Program/erase characteristics on a vertical charge trap Flash cell with poly-Si substrate and corresponding cross-section. Imec designed a new process flow and all necessary test structures to optimize the vertical transistor flow. The process flow provides a gate layer and inter-gate isolation layers, which are etched all the way down to the Si (to form the so-called 'plug'). Next, the ONO (oxide nitride oxide) memory gate stack is deposited on the sidewalls and the plug is filled with poly-Si which serves as the transistor substrate. Imec's vertical Flash transistor platform will be used to investigate the scalability of this concept for the generations corresponding to the planar 1x nodes. Further experiments will include the reduction of the cell diameter, the selection of the best ONO stack taking topography into account as well as alternative channel processing schemes. These results were obtained in collaboration with imec's key partners in sub-22nm core CMOS research.